There’s been a bit of a movement in the UC industry, with Mitel last week announcing a similar migration to a cloud first, digital transformation. We even saw Avaya redirect attention to a more modern collaboration and messaging app. We even saw Nextiva introduce their new NextOS solution, which is exactly what 8×8 seems to be gunning for with their recent strategy shift. We wanted to take a closer look at the state of 8×8, and their more recent solution developments. Where Does 8×8 Fit In? I had the chance to listen in on Mitel’s Analyst day presentation, which provided deep insight into both how Mitel views themselves, but also how they view the current market. I wasn’t necessarily surprised, but humored to see Mitel specifically state in their presentation, “We Are Not 8×8 or RingCentral.” So clearly, Mitel sees themselves positioned in a higher level of service: extending into the massive Enterprise industry, in which bigger businesses have bigger concerns. But that also helps shed some light on 8×8, where they are, and where they fit in. We agree that 8×8 and Mitel aren’t on the same plane. 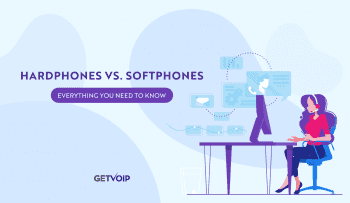 That’s not to negatively compare either of the two, its simply to recognize where 8×8 exists: and we think that is alongside the Cloud first and Cloud only providers like Nextiva, or RingCentral. And so when we understand where 8×8 sits, we can understand better the moves they make. Now 8×8 is no slouch, in the 2016 Gartner UCaaS Magic Quadrant, 8×8 was ranked as a leader, and held their position. And it seems like they are making the necessary shifts to hold that position. The recent announcements and changes coming from 8×8 expand into a few different areas. Of course the new Cloud platform is the center core, but 8×8 also focused on opening flexibility with new APIs, and further bridging the communications islands with a new messaging acquisition. We’ll get to all these, but I wanted to really start on the biggest core change: the new 8×8 Communications Cloud. 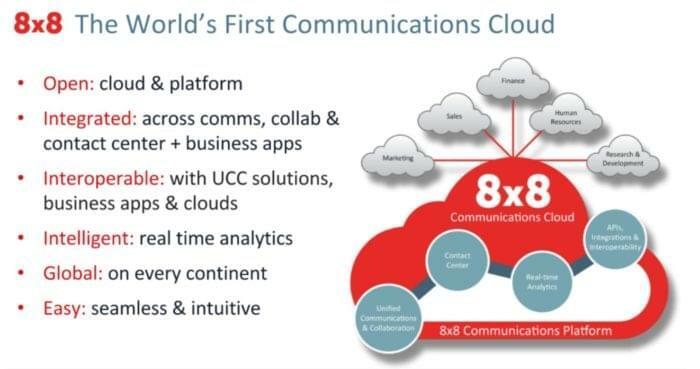 Simple put, 8×8 will now be offering a closely integrated Cloud Communications Platform, as I said similar to NextOS. This solution brings everything from VoIP communications, team collaboration, contact center functions and the deep contact center analytics, together into one seamless package. 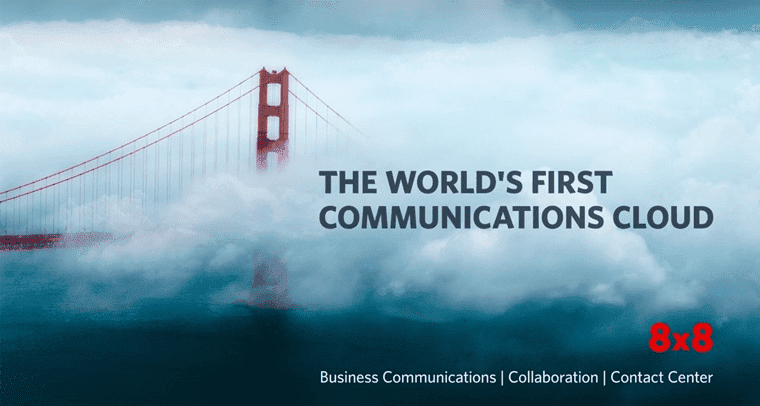 So the new 8×8 Communications Cloud brings every important aspect of successful communications into one single solution. This should in essence allow a business to seamlessly connect their communications and workflows across multiple cloud networks. 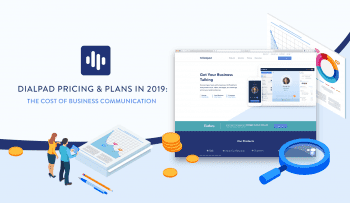 In his blog post surrounding the announcement, CEO Vik also wrote that the Communication Cloud solution stems from an Enterprise need. But more importantly, following the predicted 2017 UC trends, 8×8 offers the flexibility and customization these solutions need. And at the same time, 8×8 also opened up the borders, say to speak, for its Communications Cloud with intense API and scripting functions. At this point, a provider simply cannot launch a new product or solution without at least offering the most common integrations. 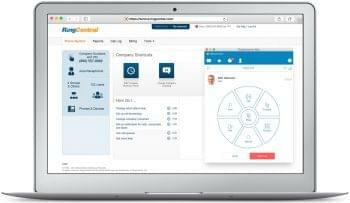 We put together a big list of CRM and VoIP solutions that play together, and of course Salesforce is a yes for just about every single provider in existence. So we can probably expect every solution to hit the important integrations, at least. But the real bonus is when a provider empowers developers with access to their own API. But when it comes to the previously noted scripted functions, 8×8 added in Script8. Essentially just 8×8’s internal scripting language, Script8 provides a “dynamic communications tool” that allows users to design their own workflows and routing procedures. Pretty much, this offers users the flexibility to either improve their own workflows, leverage existing data, or introduce new communications functions. This really seems like 8×8 attempting to innovate in new ways, not just playing catch-up as many have pointed out as criticism towards the new UC solutions that pop-up every week. I personally felt that Amazon’s Chime, while slightly unique in its approach, was simply a “I’m here too!” reminder. And we know how all over the place Google tends to be. Arguably just as, or even more, important that the core Communication Clouds expansion, 8×8 also announced their acquisition of Sameroom.io. 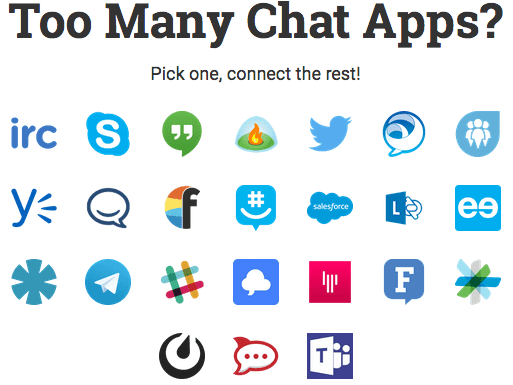 For those that are unfamiliar, Sameroom offers a solution that links together the massive list of existing team collaboration and messaging apps. So if one team in New York is on Slack, but another team in California is on HipChat, Sameroom extends a bridge between the two solutions so no one team has to switch over. This can be seen as a Band-Aid to the problem. At there does seem to be a problem emerging. There are so many options out there, it can be difficult to understand what’s best for your team. We put a guide together on how to determine the right messaging solution for your team, but even that doesn’t tell the whole story. So simply, instead of building a new solution and adding to the mega mess that is the current UC&C market, 8×8 went at the problem from a different angle. They know what people are using, and people use what they like. So the idea here was to let customers keep using their favorite solutions, but to help bridge everything together. Much in the exact same sentiment as the new 8×8 Communications Cloud. But Wasn’t 8×8 Going to Sell? Well at this point, the rumors still seem to remain as rumors. Emerging back at the end of February, picked up by Streetinsider.com and even Reuters, thoughts were that 8×8 is looking for a buyer. However as the reports stated, this wasn’t something completely unheard of before, and similar rumors were floating around in the past. The main speculation came from reports that 8×8 has been working with Morgan Stanley to field interest from other companies – but whether or not this would come to fruition was of course up in the air at the time. So how does this fit in, now that we saw 8×8 announce both an acquisition, and a new focus and shift in their solutions? Beth Schultz from NoJitter wrote a solid piece on this at the time, after speaking with Elka Popova, an analyst from Frost & Sullivan that sparked the whole thing. Essentially, the thought is that if 8×8 can build up their solution and bring in the right acquisitions under them, it will only increase the value of the company. At this point, speculation is still speculation, but this thought does remain as a logical move for the provider. It could also explain motivations to acquire the unique Sameroom solution, instead of building up another app that won’t even be adopted. 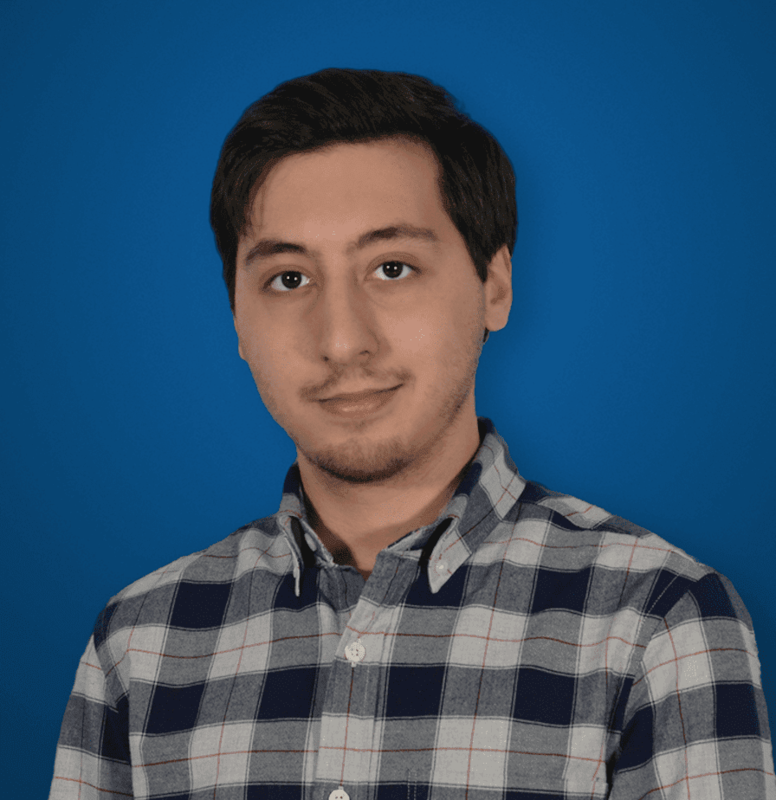 We could see this go either way, but one thing is for sure: 8×8 is focused on expanding the core product, and building off around it with increased flexibility. Instead of throwing all their darts to see what sticks in the bullseye, 8×8 is building off a basis that they know solve the issues that exist.